During September we worked on several different areas of the layout. 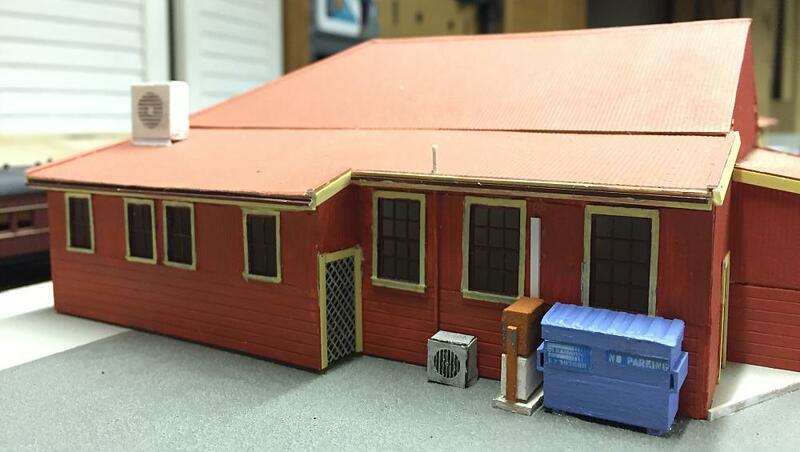 With the station buildings now fixed down to the module we were able to commence adding some preliminary detailing around parts of the station buildings. Outside the building, at the Sydney end of the Main side No. 1 platform, we added a number of detail items. A roof mounted air conditioner and a smaller A/C unit sitting next to the wall were installed. We used air-conditioning unit kits by Blair Line products from the US and painted them white. The roof mounted unit sits a small piece of styrene angle to keep it level. The orange and white electrical boxes were made from short lengths of styrene rectangular tube. Small lengths of strip styrene formed the conduits and a scrap of sheet styrene became the concrete slab they all sit on. Two rubbish dump bins were made - a blue one for near the station building, and a green one that will be installed near the goods shed. Each bin was made from four pieces of rectangular styrene tube, glued together. To these shapes we added styrene channel for the skids beneath the bins and channel for the lifting points on either side. The lid of each bin was made from some scrap ribbed styrene sheeting. The bins were then painted and appropriate signage applied, using our own images and those found on the Internet. Details at the Sydney end of the platform one station building. 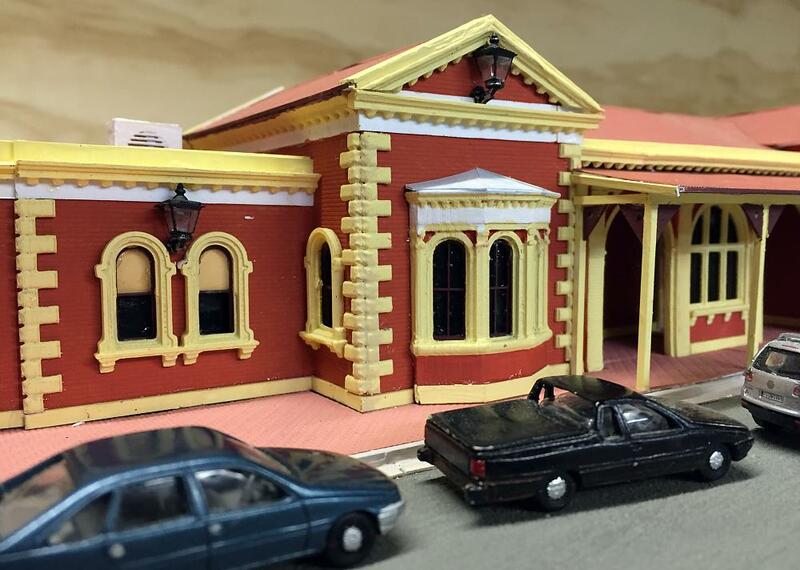 To the front entry area of the station building we added the street side awning. We had the railway drawings for this awning as well as some good photos. All-styrene construction was used - with corrugated cardboard aded to the roof - before painting it all in the appropriate colours of yellow/cream, roof red and burgundy trim. The posts are square styrene strip and the rafters and beams are rectangular strip. Guttering is channel and sheet styrene is for the roof former. The small angle brackets where the posts join the beams are made by cutting small triangles out of sheet styrene and drilling a micro-hole through the centre, painting them burgundy, before gluing them in place. Wall mounted lamps were added to the front façade in four locations as per the prototype. We used lamp kits from Langley Models from the UK. Roof mounted air conditioning units were added to several of the roof areas along the buildings. 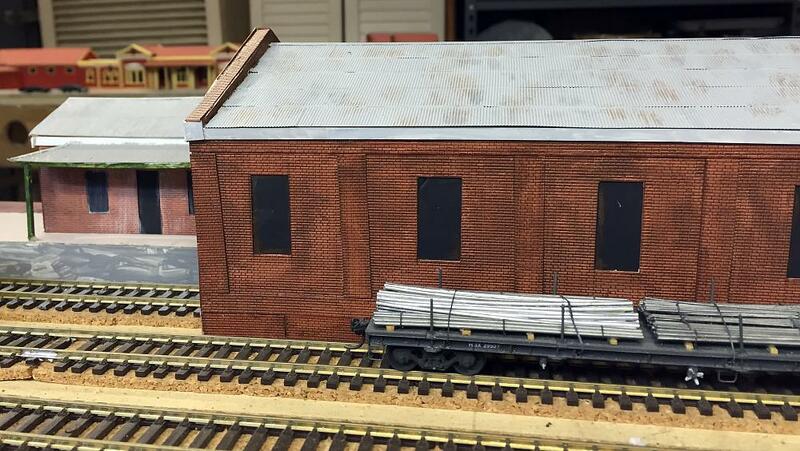 We used some kits by Blair Line products as well as some air conditioning unit mouldings we purchased from Model Railroad Craftsman. Air conditioning ducting was simulated with lengths of rectangular styrene tube. The paving around the front footpath area was added using embossed 'interlocking paving' patterned styrene we sourced from JTT Miniatures from the US. The sheet styrene was carefully cut to fit the space between the building and the kerb line and was painted a terracotta colour before gluing it in place. The road was painted a suitable dark grey asphalt colour that we mixed ourselves. To the paint we added some fine sand to give the paint some texture. As long as the sand is evenly mixed through the paint the end result once the paint dries is an excellent representation of a textured road surface. 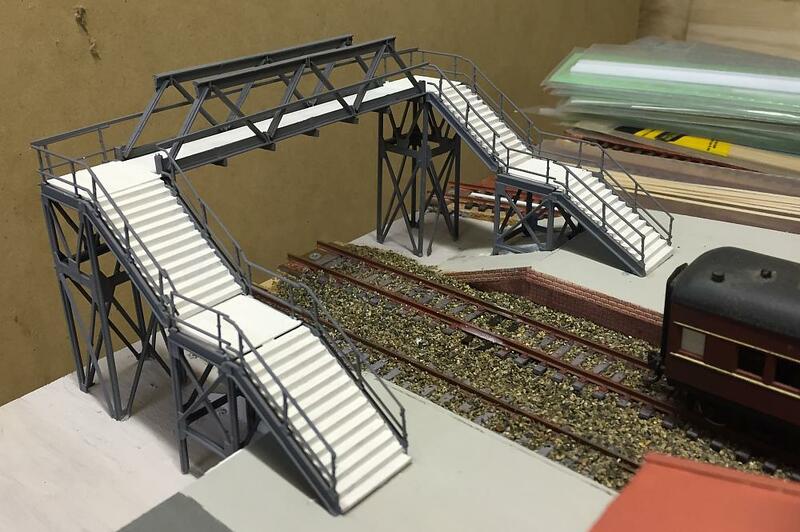 The previously assembled footbridge (kitbashed from a Kibri kit) was painted an appropriate metallic grey for the steelwork and the stairs and walkways an off-white to represent the fibre cement sheeting. This was then glued in place at the Sydney end of the platforms. There is still a lot of detailing to be done around this footbridge area. The footbridge painted and installed, awaiting further detailing. Several workshops buildings located behind the island platform were next on our list. We have the railway drawings and good photos for all three of these structures. They are simple gable roof structures - two of them are identical open-ended portal frame structures with walls and roof clad in corrugated iron that a siding passes through. The third building has corrugated iron walls, a corrugated fibro roof, and several timber framed windows. It was a little more difficult to construct due to its angled location butting into the backdrop. In all three cases we used styrene to form a shell, which was clad in corrugated iron. To the open ended structures we added styrene H-section to represent the steel portal frame structure. Next will be painting and detailing them before their installation on the module. 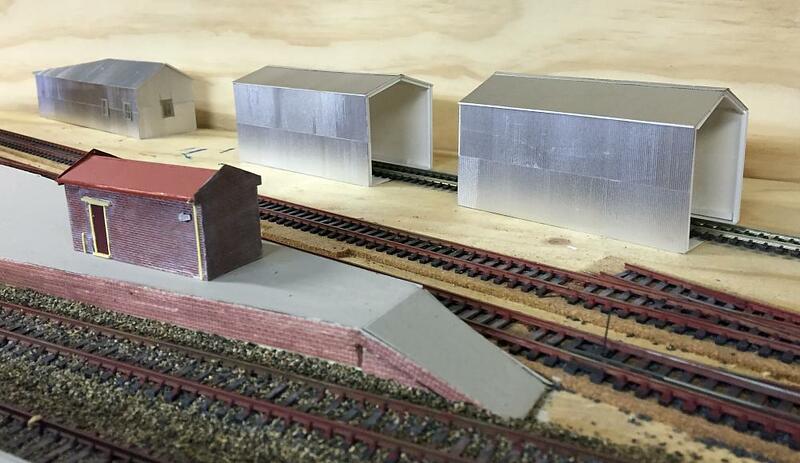 The three workshops buildings placed on the layout with a temporary backdrop clamped on. 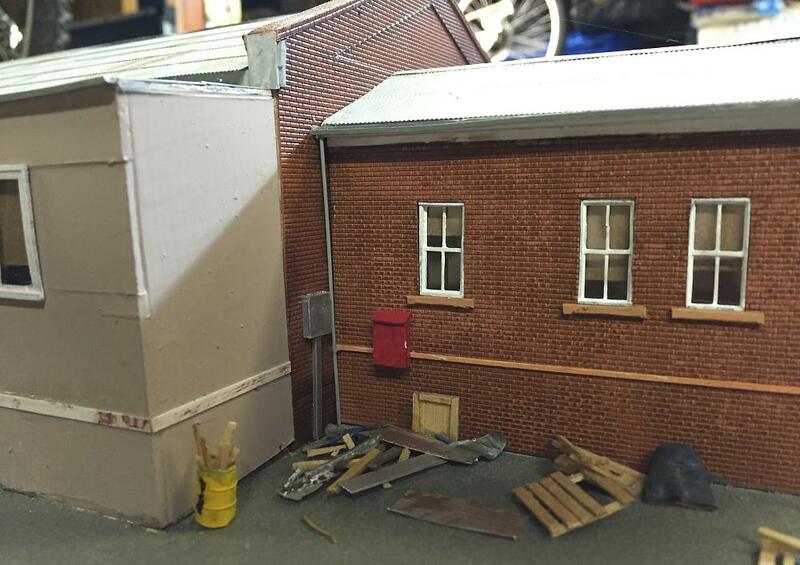 Around the goods shed office area we added some detailing - downpipes from styrene rod, an electrical box and a fire control box from scrap pieces of styrene. Each was pre-painted prior to installation: grey for the downpipe, silver/grey for the electrical box and red for the fire box. A series of other items from the scrapbox were also scattered around: drums, timber pallets in various states of disrepair, scrap timber, and scrap packaging and cladding material. Dirt, weeds and grass tufts will be needed here also. Detail items scattered around the front of the goods shed office area. View of the rear or 'non-public side' of the goods shed building.